Our Holiday Wine Sale is going on RIGHT NOW! Purchase any 12 bottles of wine, and save $100 off your order – no limits, no exceptions. 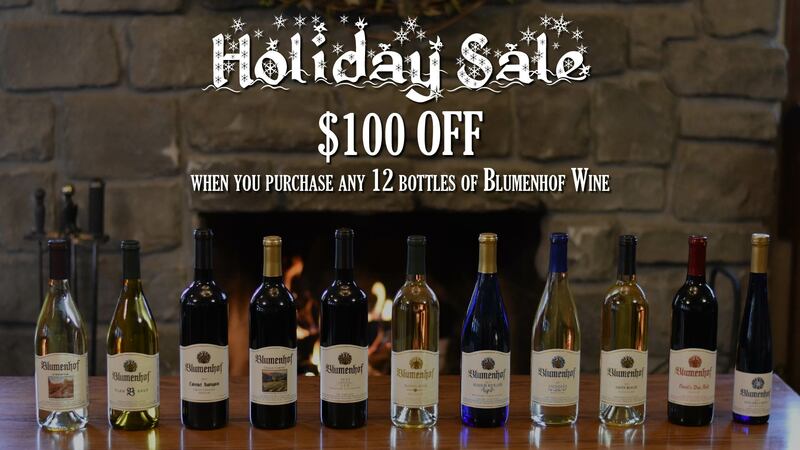 Just a really good deal on Locally-Grown, Locally-Made Blumenhof Wines to help you celebrate the holidays. Mix and/or Match to build the case of 12 bottles that’s right for you. Visit Us: We’re open 7 Days a Week, Year Round (except Thanksgiving, Christmas Day and New Year’s Day). You’ll save on the shipping charge, and you can try all of our wines for FREE before you decide on a purchase. Plus, we’d love to see you. New members can opt-in to receive the November 2018 shipment. Sign up by December 14th for delivery before Christmas. 12/25 (Christmas Day): CLOSED – MERRY CHRISTMAS!